Water pollution was the number one priority in 2008 when Rio de Janeiro accepted the bid to host the 2016 Summer Olympic Games. Brazilian politicians promised that waterways would be free of pollution in time for the Games eight years later, but just months before the athletic events began, the contamination of the city’s water with raw sewage dominated the news coverage of the event. A study released by the Associated Press found high levels of adenovirus at Gloria Marina, on the bay’s western shore, and at Rodrigo de Freitas Lagoon, an inland lake that hosts the rowing competitions. Nearly 90 percent of Olympic water sites tested over a 16-month period registered infectious strains of the virus, which can cause diarrhea and respiratory problems. The World Health Organization, using bacterial indicators was able to deem the water acceptable for recreational activities, but also noted that some areas failed to meet Brazilian water quality standards and would be classified as “poor” or “very poor” under WHO guidelines. Because of this, the famous “don’t open your mouth” advice was born, given to athletes who would be participating in water events. In addition to the poor quality of water in the Rio waterways, the Olympic pools used for competitions such as diving and synchronized swimming have come under fire. 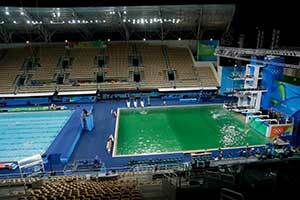 Last week, during the diving competition, spectators and athletes were shocked to see the pool becoming rapidly green. A stunning comparison of the pool next to it showed the dark green color that took over the pool, clouding diver’s eyes during the event. It was many days before Olympic officials could confidently say what happened to the pool and whether or not it would have health affects to those who had been exposed to the water. According to a statement by FINA, the color of the water was a result of the tanks running out of chemicals needed for the treatment process. The events that were supposed to take place in the pool were rescheduled as the pool was emptied and cleaned. Millions of gallons of water were pumped in from a neighboring pool so that the Games could continue. As many news stories point out, this is the water that nearly 12 million Rio residents. Only about half of Rio’s wastewater is treated, despite the city’s promise to treat 80 percent of its sewage before the Olympic Games.